Swamp Boys BBQ is a Winter Haven, Florida based nationally ranked professional competition barbecue team. I began competing as a “pro” in 2004. I truly began at the bottom as a dishwasher for another team, not knowing anything. From there, it was nothing but hard work; tens of thousands of hours, and a strong desire to be among the best in the world. The result... a Top 5 team in the Florida BBQ Association (FBA) in 2006 and 2007, Team of the Year in 2008 and 2009, and have been in the top 3 since then. We were ranked the #1 team in the country for 67 straight weeks, including all of 2009, by the National BBQ Rankings. We have been ranked #1 nationally again here in 2013. We compete primarily in the southeast – FL, AL, GA, SC, NC and TN in both FBA and KCBS contests. We have won over 40 Grand Championships and over 30 Reserve Grand Championships. We won the World Championship in Pork Shoulder. I was hired to go to Brazil on 2 different occasions to train and help open that country’s first ever American-Style Barbecue restaurant. I have taught professional BBQ classes from FL to IL to hundreds of people from all over the country and Canada. 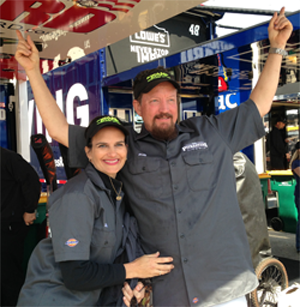 I’ve been a spokesman for Kingsford Charcoal at the Daytona Firecracker 400 and the Steve Harvey Show. We competed in two episodes of Season 4 of the TV show BBQ Pitmasters. There are many more honors. But to sum it up short and sweet, we’ve been blessed. In addition to competing, we also offer both barbecue and grilling classes, Swamp Boys Q School, that cover all skill levels from the beginner, to seasoned competition team members. Classes in your state or country can be arranged. Also, special event catering is available on a limited basis with groups from 30 to 1,000. If it has to do with cooking outside with wood and charcoal, Swamp Boys BBQ are your go-to pros!